Home LifestyleMindset	What is a Simple Life? What is a simple life? Is a cabin in the woods (like Thoreau in Walden ) necessary for you to live simply? Do you need to turn your back on all modern conveniences, worse yet, technology? Luckily, there are no hard and fast rules dictating what defines a simple life. Each of us comes to a simple life for different reasons so each version of a simple life is as unique as we are. The world, it seems, revolves around not just what you have now but what you’ll buy next. Breaking that cycle is challenging because we’re constantly bombarded with bright and shiny new things to buy and they’re presented in such a way that we want to buy them. Realising I was as caught in this cycle as anyone else was my first big step toward living a simpler life. Equally motivating was the understanding that while I liked nice things, what I really wanted was freedom. Then I lost my job… This was back in the late 80’s recession and that period of unemployment, while horrendous financially, taught me some very valuable lessons about life, and about myself. At that time in my life, living simply was my only choice. I could barely cover my mortgage (interest rates were around 18%) so every single cent was precious. Nothing was wasted. I learned to make do with what I had. I sold off whatever I could to keep afloat. I learned to be creative with whatever produce was cheapest that week. It was tough. It was challenging. Ultimately, though, it was empowering. What I learned from that period was that once my basic needs were met, I really didn’t need much else. When I was working again, I stuck to that needs only philosophy as much as possible. I no longer shopped for entertainment and I made a point of learning the skills of self reliance: baking, cooking economically, buying second hand when I could, repairing and reusing whenever it was possible. I was living life by a different set of rules and I was happy and content. My view of what’s important in my life had changed forever. Nearly 25 years later, I’ve been married, borne a child, and divorced, but that period of financial hardship still impacts the way I live today more than any other. Sure, there have been times when I haven’t been very frugal and there have been financial decisions made hastily which, in hindsight, could have been delayed or avoided altogether. And, yes, I own a dishwasher and other modern conveniences like a food processor and mobile phone. I’m not tucked away in a cabin in the woods (much as I’d like to be) so I still very much live in the modern and busy world. However, always, the goal is choosing to slow the pace of my life as much as possible, to take pleasure in the small moments as well as the big events and to live a simple life – as defined by me. 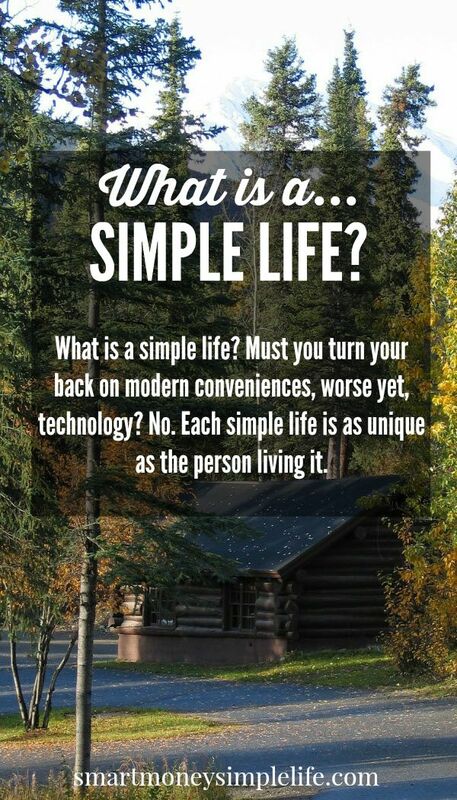 Have you chosen to live a simple life? What does a simple life look like to you? I like modern conveniences, but I do choose to simplify my life when it comes to the kids and activities. I enjoy having weekends and evenings that aren’t always crammed full of activities. To me, the “simple life” should include plenty of leisure time with nowhere to be and nothing to do! A simple life is a happy life!